Bay Area scientists are among the NASA planet hunters who announced today they've found a planet more like Earth than any planet found before. NASA launched the Kepler telescope in 2009, and are now pouring over the data from the mission. Kepler has detected hundreds of planets orbiting around distant stars, but the planet identified today as Kepler 186F is close to Earth in size, and orbits its star at a distance that's known as the habitable zone, or "Goldilocks zone." That is, temperatures on the planet could be not too hot, and not too cold, but could be just right for life, that is, life as we here on Earth know it. "This is the first validated Earth-sized planet in the habitable zone of another star," says Elisa Quintana, a Kepler Mission Research Scientist based at the SETI institute in Mountain View. Kepler-186f circles a red dwarf star 500 light-years from Earth. The planet is about ten percent bigger than Earth and may have liquid water. 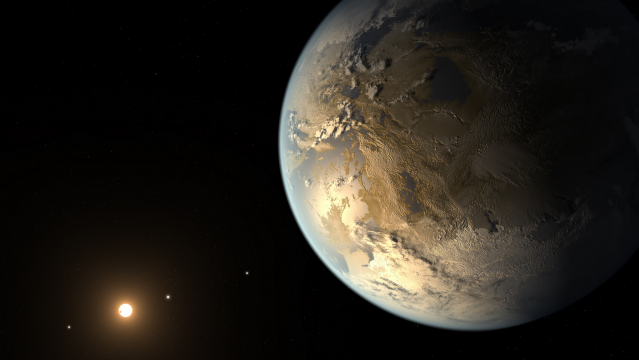 For more details about the discovery of Kepler 186F, check out this story from NPR.